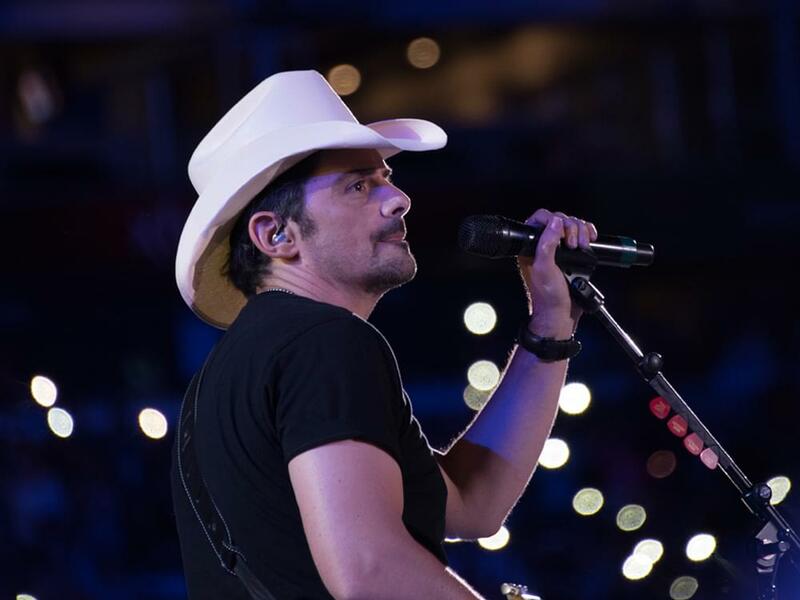 After more than four years, Brad Paisley returned to Nashville’s Bridgestone Arena on April 6 for a headlining gig as part of his Weekend Warrior Tour, which also featured openers Dustin Lynch, Chase Bryant and Lindsay Ell. As expected, Brad showed off his guitar chops and delivered a number of his fan-favorite hits, including “Perfect Storm,” “American Saturday Night,” “I’m Still a Guy” and more. But the strangest delivery of the night came from Dustin Lynch, who presented Brad with a dwarf goat cloaked in a Wonder Woman outfit. Dustin gave the goat, which he named Tele after Brad’s fondness of Telecaster guitars, to Brad as an end-of-tour thank-you gift. “G-O-A-T” is the acronym for “Greatest Of All Time,” which is commonly used in sporting and entertainment circles. Anyone know how to take care of a goat? ?” Check out the goat below, which is standing in front of a cherry red 1961 Corvette.